User configurable (Operator Callsign, Bands, Modes, Location). Suitable for SOTA Activator, SOTA Chaser and SOTA SWL logs. Create or edit SOTA CSV logs for direct upload to the SOTA database (one log can be uploaded for both Activator and Chaser entry). 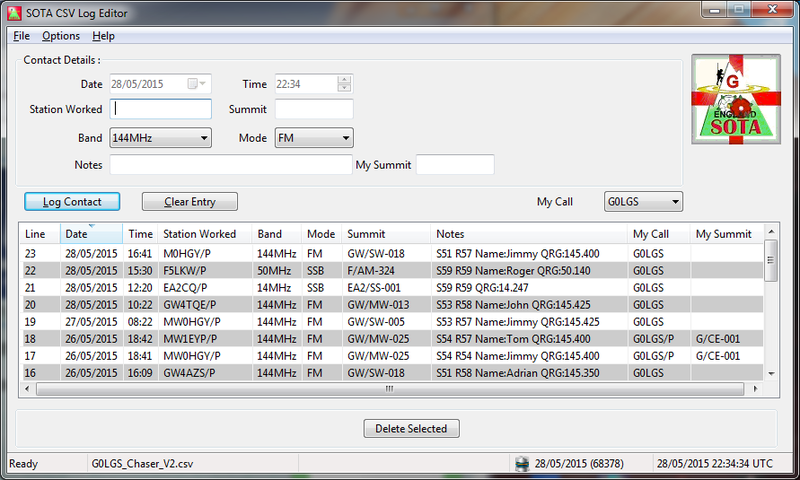 Summit reference checking (optional) - using latest summit list from SOTA Database site. Shows Summit name, Locator, Bearing and Distance information (when Database is available). ADIF export of Log entries, suitable for direct import into many main station logging programs (when used with optional features). Program updates can be directly downloaded and installed (with 'Windows UAC' prompts when necessary). Tested under WINE on Linux (you will need to configure MDAC to use the Summit Reference Database).